Last night, my friend Hannah and I finally got to watch Say Anything together when we had a dinner and a movie night at my house. 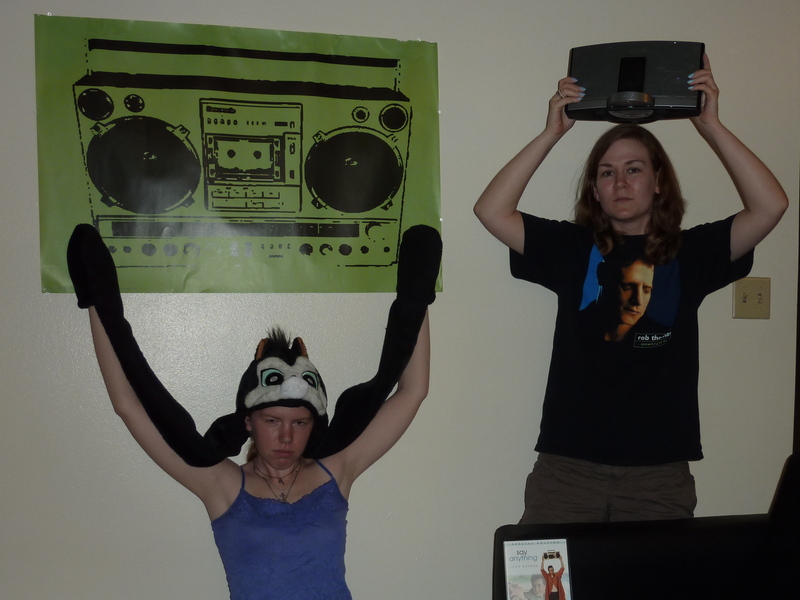 Hannah was cool enough to go along with my photo idea and posed with me in the vein of the iconic image of John Cusack’s character Lloyd holding his boombox over his head. Hannah caught several good quotes from the Cameron Crowe film, including, “The world is full of guys. Don’t be a guy. Be a man.” My favorite came at the end of the film when Lloyd and Diane were sitting on a plane together on their way to Europe so Diane could attend a prestigious school. She pointed out that no one thought their relationship will work out, to which Lloyd wisely replied, “No, but you just described every success story.” I needed that advice for my own life, a reminder that trial and error, a conscious effort, leads to success. Sometimes, as Diane illustrates as she dates Lloyd, we face adversity in how others view us, our relationships, our jobs, our situations. We satisfactorily progress these facets of our lives when we consciously move forward. Diane and Lloyd don’t start off together. Lloyd and Diane go on their first date because Lloyd asked her out and because she agreed to go. They continue to get closer because they learn through trial and error how to best relate to each other as Lloyd teachers Diane how to drive, Diane discloses her family past, Lloyd declares his love. For a period of time, Diane breaks up with Lloyd. The relationship rekindles after she breaks up with him because he tries every venue to reunite; he leaves numerous voicemails, and he plays their song (“In Your Eyes” by Peter Gabriel) from a stereo he holds over his head outside her work window. Both sides of the relationship faced disbelief and discouragement from those closest to them. Yet they still continued with their trial and error to find out what they needed in a relationship and how to best reach those goals. A lot of trial and error stands before me, but what matters is I see the overall picture of what I want to do. I must step forward to accomplish that. Not all steps will lead to immediate success; some initiative, to gain experience and exposure in social media for example, will not get the desired results. I plan to try my hand at writing posts about beauty. It can lead to an ultimate career at a business like Julep where I can share my nail art; I may also realize I will never be cut out for that writing even after practice. I won’t know if that’s another potential style for me until I do it. My experimentation with photography will yield similar prospects. I must take the camera out and use my keen eye to point and shoot. I will continue to learn how to consider angle, lighting, composition; a lot of that will result from me moving the camera in my hand to see what happens. As always, I will take some bad pictures, sometimes getting no good shots in a day; but, as I see what works, I also see what does. All I have to do is take the camera out when I see a subject I want. Trial and error will lead me to success. With the ultimate goal of shining Light, it’s hard to fail so greatly I can’t continue or make a speck of difference to someone along the way, sharing the wisdom of trial and error experience and the ultimate success it I’ve seen. I snapped this photo at the beginning of my vacation, which started with an eye appointment the first morning. 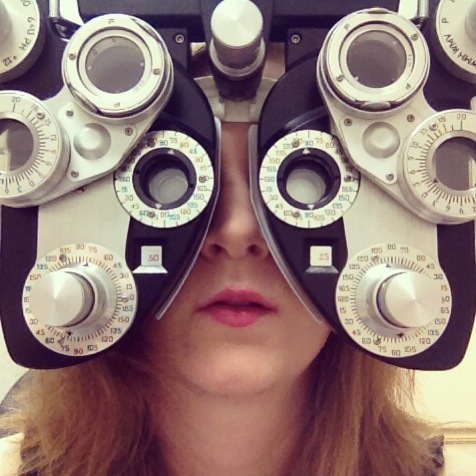 As a big Justin Timberlake fan, I couldn’t resist the urge to combine my love for his classiness with my budding photography in my own version of his 20/20 Experience album cover art. At first I contemplated changing my profile pictures to that imitation, which got me cogitating (as usual). It stirred me to finally reveal a little more of myself on my page and make the information my own. 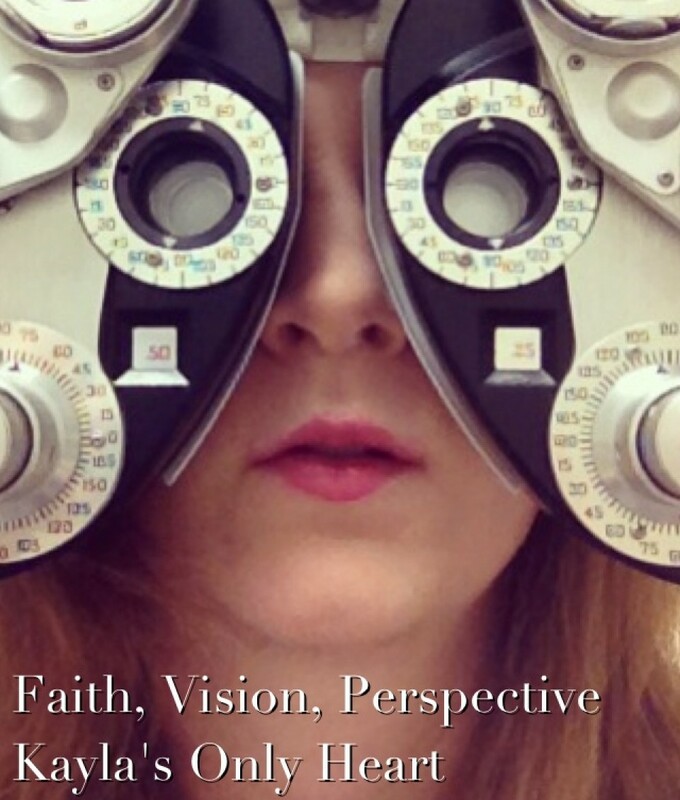 What better reflects my interest in perspective and hints at the facets of what shapes mine than a selfy of my face behind a phoropter? The only slightly off detail is that you can’t see my eyes. That means you’ll have to read my blog to gain insight into how I see myself and the world around me. I aim to reflect the Light through encouraging words. This photo should make its way onto my main page soon, accompanying a couple other wordy additions.